The only licensed and certified chef tour-guide in Charleston, Chef Forrest Parker, was selected by the governor as a South Carolina Chef Ambassador in 2016, in his home state where he began in the culinary arts in 1995. Frequently covered by food writers, Parker’s innovative dishes, encyclopedic knowledge of Charleston history and commitment to championing the work of heritage food producers led to his roles as executive chef in some of the city’s finest restaurants, including Louis’s, Old Village Post House, The Drawing Room and Revival. Chef Forrest is teaching future culinarians as an instructor at Charleston Culinary Institute. He’s been a Charleston Wine and Food Festival featured chef for a decade with his guest Chefs Katie Button, Tandy Wilson, Kristin Essig, Barbara Lynch, Justin Smilie and Michael Gallina. Chef Forrest has also been a featured chef at the Atlanta Food and Wine Festival, and for four years at the Euphoria Food and Wine Festival in Greenville, not far from his hometown of Anderson, South Carolina. 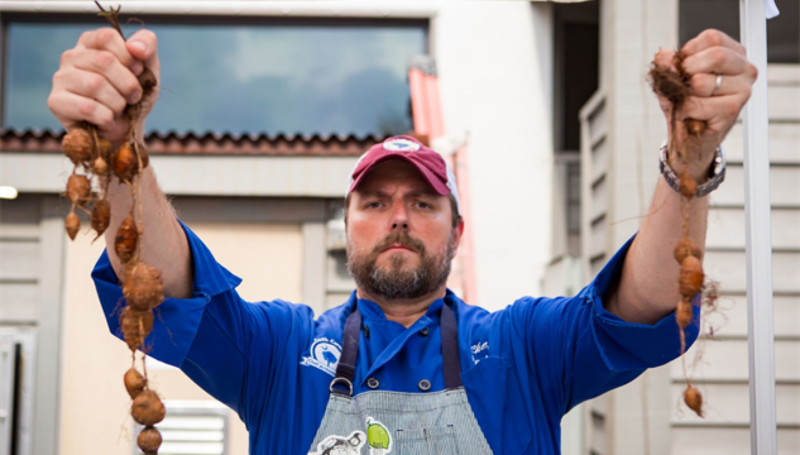 Chef Forrest is a member of Charleston’s Palmetto Guild, the James Beard Foundation, the Southern Foodways Alliance and SlowFood Charleston. Chef Forrest’s Undiscovered Charleston and life partner is me, his wife. I am Kim Keelor Parker, and I work in Charleston as a senior communications director. Don’t be surprised to see me or one of our sons, Justin and Jesse, on your tour. Jesse is a jazz and experimental music artist and College of Charleston School of music major . He composes and plays the guitar, pedal-steel, and piano (and sings when I beg him to). You can find him playing frequently around town. Justin is a businessman, an alumnus of the International Business program at the USC’s Darla Moore School of Business , and has already traveled much of the globe. He comes home to Charleston as often as he can, but never enough for us! Our two unruly Chihuahuas can usually be found in the back yard searching for crabs. Ask Chef Forrest about the story behind how they came to be part of our family.